After the opening of the evening session the President of the Court Comrade Ulrich addresses each of the accused, granting them the floor for their speeches of defence, since they refused counsel of defence. All the accused in turn tell the Court that they will not make their speeches of defence, giving as the reason that they will avail themselves of their right of the last plea. A number of the accused emphasize that they do not regard themselves entitled to defence as they recognize the correctness of the charges made against them. After a short recess the Court commences the hearing of the last pleas of the accused. The first to speak is Mrachkovsky. "In 1923 I became a Trotskyite. I took a despicable path, the path of deception of the Party. We must cross out past services; the past does not exist. But the present cannot be crossed out. I am a couter-revolutionary. . . .
"I do not ask for mitigation of my punishment," continues Mrachkovsky. "I do not want that. I want to be believed that during the investigation and in court I told the whole truth. I want to depart from life without carrying any filth with me. "Why did I take the counter-revolutionary path?" says Mrachkovsky further. "My connection with Trotsky - that is what brought me to this; it is from that time on that I began to deceive the Party, to deceive its leaders. Some may say: 'The Party gave no help; it might have been possible perhaps to wrest the fellow from counter-revolution and save him, but the Party took no measures.' That would not be true. The Party did all it could to tear me away from counter-revolution. The Party helped me and helped me a great deal.
" I think I have said everything," says Mrachkovsky in conclusion. "Let everybody remember that not only a general, not only a prince or nobleman can become a counter revolutionary; workers or those who spring from the working class, like myself, can also become counter-revolutionaries. "I depart as a traitor to my Party, as a traitor who should be shot. All I ask is that I be believed when I say that during the investigation I spat out all this vomit." "Who will believe a single word of ours?" asks Evdokimov in opening his last plea. "Who will believe us, who played so detestable a comedy at the fresh grave of Kirov whom we had killed; who will believe us,who only by accident, not through any fault of our own, did not become the assassins of Stalin and other leaders of the people? Who will believe us, who are facing the Coart as a counter-revolutionary gang of bandits, as allies of fascism,of the Gestapo? Did the heart of even a single one of us, who were convicted in the last year's trial of the Zinovievites in Leningrad, shudder at the thought of our accomplices remaining at liberty, knowing as we did, although in prison, that any day, any hour, another dastardly shot may be fired? Not one of us did what he should have done had we been bound by the thinnest of threads to the cause of the revolution. "The difference between us and the fascists is very much in our disfavour, Fascism openly and frankly inscribed on its banner: 'Death to Communism.' On our lips we had all the time 'Long Live Communism,' whereas by our deeds we were fighting socialism vicorious in the U.S.S.R. In words - 'Long live the Communist Party of the Soviet Union.' In deeds - preparation for the assassination of the members of the Political Bureau of the Central Committee of the Party, one of whom we did kill..In words - 'Down with imperialism,' in deeds - banking on the defeat of the U.S.S.R. in the struggle against international imperialism." Continuing, the accused Evdokimov says: "Trotsky is not with us here in the dock because he is abroad. He has two perspectives before him: either to disappear immediately and without a trace, as Azef did, not only from the political arena, but from the arena of life in general and go into oblivion, hide behind some false name as Azef did - or else, at some time, face a proletarian court." "I don't consider it possible to plead for clemency," says Evdokimov in conclusion. "Our crimes against the proletarian state and against the international revolutionary movement are too great to make it possible for us expect clemency." "The political importance and the past of each of us," says Dreitzer, "were not the same. But, having become assassins, we have all become equals here. I, at any rate, am one of those who have no right to expect nor to ask for mercy." "Whatever our fate may be," says the accused Reingold in his last plea, "we have been already shot politically. The representative of the State prosecution, speaking with the voice of 170,000,000 Soviet people, demanded that we be shot like mad dogs. I knew where I was going and what I was going for. I and the whole of the terrorist Trotskyite-Zinovievite organization sitting here have been exposed by this trial as the shock troop, as a white-guard, fascist shock troop, of the international counter-revolutionary bourgeoisie. "Our trial, the trial of the Trotskyite-Zinovievite terrorist and fascist organization, will bury the political corpses of Zinoviev, Kamenev and Trotsky, and of his shadow, his loyal armour-bearer, Smirnov, as under a heavy tombstone. "I fully admitted my guilt. It is not for me to plead for mercy." "I am guilty of the assassination of Kirov," declares Bakayev. "I took a direct part in the preparation of other terroristic acts against the leaders of the Party and the government. I am prepared to bear full responsibility. We Trotskyites and Zinovievites not only worked for the benefit of the international counter-revolutionary bourgeoisie, we also worked hand in hand with the agents of the most bitter enemy of the working class, fascism. "The facts which were revealed before this Court show to the whole world that the organizer of this unprecedented Trotskyite-Zinovievite counter-revolutionary terrorist bloc, its moving spirit, is Trotsky. I have wagered my head over and over in the interests of Zinoviev and Kamenev. I am heavily oppressed by the thought that I became an obedient tool in the hands of Zinoviev and Kamenev, became an agent of the counter-revolution, that I raised my hand against Stalin." Bakayev turns to Zinoviev and accuses him of not being frank even at this trial. Bakayev concludes by stating that he realizes the gravity of his crime and awaits the deserved and just verdict of the proletarian court. The accused Pickel makes a detailed review of the history of the development of the Trotskyite-Zinovievite opposition which became a gang of counter-revolutionary terrorists. He says that from 1925 onwards, the struggle this opposition waged against the Party and its Central Committee contained all the elements of political banditry. The struggle started with filthy insinuations against the Party leadership and ended with terroristic acts. "Only one conclusion can be drawn," says Pickel. "We represent a most brutal gang of criminals who are nothing more nor less than a detachment of international fascism. Trotsky, Zinoviev and Kamenev were our banner. To this banner were drawn not only we, the dregs of the land of Soviet, but also spies, and agents of foreign states and those sent here for diversive activities. "The last eight years of my life have been years of baseness, years of terrible, nightmarish deeds. I must bear my deserved punishment." With this the evening session closes. During the evening session of August 23, last pleas are made by Ter-Vaganyan and Fritz David. In his last plea, the accused Ter-Vaganyan fully admits his guilt before the Soviet state and the Party. "I am crushed by the weight of all that was revealed here,"says Ter-Vaganyan. "I am crushed by the speech of the State Prosecutor." "It is very hard to bear when, by the whole course of one's crime, one finds oneself in the position of an enemy, of a fascist being tried by a proletarian court. In such a moment it would of course be hypocrisy if I did not say one thing: I would like to have the opportunity of exerting every effort to fill the abyss, the chasm, which separates me from my former comrades. "I bow my head in guilt before the Court and say: whatever your decision may be, however stern your verdict, I accept it as deserved." "I want to assure the proletarian Court," says the accused Fritz David, "that I curse Trotsky. I curse that man who ruined my life and pushed me into heinous crime." At 7. p. m. the Court withdraws to the Council Chamber. On August 24, at 2:30 p. m., the president, Comrade Ulrich, reads the verdict. 7. Smirnov, Ivan Nikitich, born 1880, employee all seven being charged with having committed crimes covered by Articles 588 and 5811 of the Criminal Code of the R.S.F.S.R. 16. Lurye, Nathan Lazarevich, born 1901, employee all being charged with having committed crimes covered by Articles 19 and 588, 5811 of the Criminal Code of the R.S.F.S.R. In the autumn of 1932, on the instructions of L. Trotsky received by I. N. Smirnov, leader of the Trotskyite underground organization in the U.S.S.R., a union took place between the Trotskyite and Zinovievite underground counter-revolutionary groups which formed a "united centre" consisting of Zinoviev, Kamenev, Evdokimov and Bakayev (representing the Zinovievites), and of Smirnov, Ter-Vaganyan and Mrachkovsky (representing the Trotskyites). The union of these counter-revolutionary groups was achieved on the basis of the use of individual terror against the leaders of the C.P.S.U. and the Soviet Government. The Trotskyites and Zinovievites, on the direct instructions of Trotsky, received by the "united centre" through the accused Smirnov, Holtzman and Dreitzer, in this period (1932-36) concentrated all their hostile activities against the Soviet Government and the C.P.S.U. on the organization of terror against their leaders. The Court has established that the "united centre," on the direct instructions of L. Trotsky and Zinoviev, organized and carried out on December 1, 1934, through the medium of the underground terrorist Leningrad Zinovievite group of Nikolayev-Kotolynov, the foul murder of the member of the Presidium of the Central Executive Committee of the U.S.S.R. and member of the Central Committee of the C.P.S.U., Comrade Sergei Mironovich Kirov. Not confining themselves to the assassination of Comrade Kirov, the Trotskyite-Zinovievite centre prepared a number of terroristic acts agains Comrades Stalin, Voroshilov, Zhdanov, L. M. Kaganovich, Orjonikidze, Kossior and Postyshev. The materials of the court investigation and the confessions of the accused Zinoviev, Kamenev, Evdokimov, Bakayev, Mrachkovsky and Dreitzer have established that L. Trotsky, from abroad, and Zinoviev within the country, expedited by every means the preparations for the murder of Comrade S. M. Kirov. For the purpose of expediting the murder of Comrade S. M. Kirov, Kamenev, in June 1934, on the instructions of the united Trotskyite-Zinovievite centre went to Leningrad where he conducted negotiations with the leader of one of the Leningrad terrorist groups, Yakovlev, whose case has been set aside for a separate trial, about the organization of this terroristic act against Comrade Kirov. The Court has also established that on the instructions of the "united cetre" the accused Bakayev, in November 1934, also made a special journey to Leningrad to check up on the preparedness of the Leningrad terrorist group of Nikolayev-Kotolynov for the carrying out of the assassination of Comrade Kirov. At a secret meeting of the members of this Leningrad terrorist group, Bakayev heard the report of Leonid Nikolayev, the murderer of Comrade Kirov, and in the name of the united Trotskyite-Zinovievite centre, gave him and his accomplices a number of practical instructions concerning the organization of the assassination of Comrade S. M. Kirov. It was in conformity with these instructions that L. Nikolayev and his accomplices committed the foul murder of Comrade S. M. Kirov on December 1, 1934. The Court has also established that in 1934, the accused Bakayev, Reingold and Dreitzer, in accordance with the decisions of the "united centre," twise tried to make an attempt on the life of Comrade Stalin. In order the more successfully to commit the terroristic acts planned by the "united centre" it organized in 1933 in the city of Moscow, the so-called "Moscow terrorist centre," consisting of the accused Reingold, Pickel and Dreitzer, under the direct guidance of the accused Bakayev, a member of the "united centre." The "united centre" instructed the accused Bakayev to make practical preparations for the assassination of Comrades Stalin and Kirov, and it instructed Dreitzer, a member of the "Moscow terrorist centre" to organize a terroristic act against Comrade Voroshilov. Not confining himself to the organization of a number of terroristic acts against the leaders of the Soviet Government and the C.P.S.U. under the immediate direction of the "united centre," L. Trotsky, in the period of 1932-36, was systematically sending a number of terrorists into the U.S.S.R. from abroad for the same purpose. In November 1932, L. Trotsky sent to the U.S.S.R. Berman-Yurin and Fritz David; and before leaving, the latter received from L. Trotsky personal instructions with regard to the organization of the assassination of Comrade Stalin. In the same year, 1932, L. Trotsky sent to Moscow from Berlin the terrorist Nathan Lurye. In conjunction with Franz Weitz, agent of the Gestapo and a person trusted by Himmler, now chief of the Gestapo (Franz Weitz was then living in Moscow under the guise of a foreign specialist), Nathan Lurye made preparations for attempts on the lives of Comrades Stalin, Voroshilov, Kaganovich and Orjonikidze. In the winter of 1932-33, after the departure of Franz Weitz from Moscow, Nathan Lurye and his terrorist group continued the preparation of these terroristic acts jointly with the accused Moissei Lurye who arrived in Moscow from Berlin in 1933, and who had also received from Trotsky instructions to expedite terroristic acts against the leaders of the Soviet Government and the C.P.S.U. In 1934, while at Chelyabstroi, Nathan Lurye tried to make an attempt on the lives of Comrades Kaganovich and Orjonikidze. Finally, the said Nathan Lurye, on May 1, 1936, on the instruction of, and by previous agreement with, Moissei Lurye, tried to make an attempt on the life of Comrade Zhdanov during the First of May demonstration in Leningrad. In the summer of 1935, L. Trotsky, through his son L. Sedov,sent to the U.S.S.R. from Berlin the terrorist V. Olberg who used a false passport issued in the name of a subject of the Republic of Honduras. V. Olberg obtained this passport with the aid of the German secret police, the Gestapo, having first received the consent of L. Trotsky, through the latter's son Sedov, to utilize the assistance of the German secret police in this matter. On arriving in the U.S.S.R., V. Olberg established contact with the counter-revolutionary Trotskyite terrorist group in the city of Gorki, and trained a number of terrorists who were to commit a terroristic act against the leaders of the Soviet Government and the C.P.S.U. 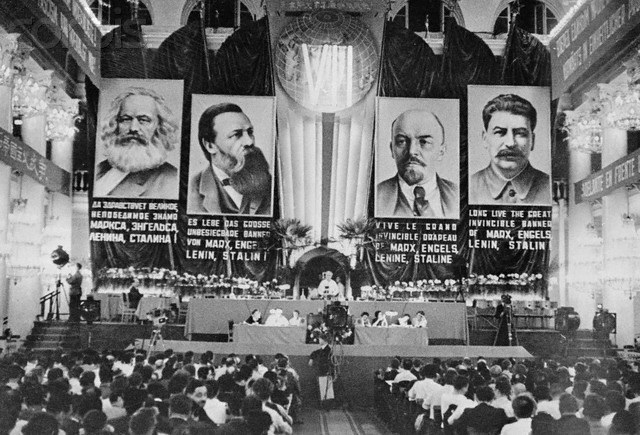 in the Red Square in Moscow on May 1, 1936. The court investigation has also established that simultaneously with the preparation of terroristic acts against Comrades Stalin, Voroshilov, Zhdanov, Kaganovich and Orjonikidze, the Trotskyite-Zinovievite terrorist centre made preparations for terroristic acts against Comrades Kossior and Postyshev through the medium of the Ukrainian terrorist group operating under the direction of the Trotskyite Mukhin, whose case has been set aside for separate trial. c) Having organized a number of terrorist groups who made preparations to assassinate Comrades Stalin, Voroshilov, Zhdanov, Kakanovich, Orjonikidze, Kossior and Postyshev - i.e., crimes covered by Articles 588 and 5811 of the Criminal Code of the R.S.F.S.R. i.e., crimes covered by Articles 19 and 588, 5811 of the Criminal Code of the R.S.F.S.R. On the basis of the above, and guided by Articles 319 and 320 of the Code of Criminal Procedure of the R.S.F.S.R., the Military Collegium of the Supreme Court of the U.S.S.R.
all to the supreme penalty - to be shot, and all property personally belonging to them to be confiscated. Lev Davidovich Trotsky, and his son, Lev Lvovich Sedov, now abroad convicted by the evidence of the accused I. N. Smirnov, E. S. Holtzman, Dreitzer, V. Olberg, Fritz David (I. I. Kruglyansky) and Berman-Yurin, and also by the materials in the present case as having directly prepared and personally directed the organization in the U.S.S.R. of terroristic acts against the leaders of the C.P.S.U. and the Soviet State, are subject, in the event of their being discovered on the territory of the U.S.S.R., to immediate arrest and trial by the Military Collegium of the Supreme Court of the U.S.S.R.
President of the Military Collegium of the Supreme Court of the U.S.S.R. Vice-President of the Military Collegium of the Supreme Court of the U.S.S.R.